There is no moral imperative driving this message, tonight — no calls for a life of self sacrifice, no direct calls for intensive reflection this night, not even a real punch line of the story. I will let you decide if these thoughts call for that. Tonight, I’m thinking back…. decades gone by, in fact. Indeed, I’m going to relate to a tale of a Christmas Eve more years ago than I care to tell you. I could not been much more than 12 or 14 years old. For some reason, and I don’t fully recall why, we happened to be at my maternal grandmother’s farmhouse. We weren’t there for long — perhaps 20 minutes or so. I think she must have come with us to Christmas services that night, and apparently, my father was performing transportation duty. You see, my grandmother sometime in the late fifties had bought a farmhouse about 60 miles out of town, and perhaps five miles off the nearest paved road. She was one who loved nature in all its forms. For a lot of years, she had two houses. She had one in the city, in a neighborhood which had never been all that good, in my memory. She lived in town during the week, because she worked at a manufacturing plant just around the corner. On the weekends, though, she jumped into that battered 1952 Chevy she had, and came down to this somewhat beat up and certainly ancient farmhouse. The place had to be over 100 years old when she got it — closer to 200 years old, now. It was far enough off the beaten path that at the time, it was a long distance call to contact the fire department, or the police. Grandma tended to come down here on holidays too, in fact every chance she had, really. I can see her, in my mind’s eye, sitting on the porch in the summertime, bird book in one hand and a really good set of binos in the other. Not for this night, though. Far too cold for birds, and besides, the porch swing was covered with snow. We got to the farmhouse, and everyone but myself went inside. I knew we’d be leaving shortly, so I saw no need for going in. Anyway, the darkness and the cold night was somehow calling to me. As I say, it was a cold clear night…. nearly zero in fact. Cold and clear. The kind of night where the stars far outshone any Christmas ornaments that might have been in someone’s outdoor display, looking like, as Charlie Daniels once said, diamonds on black velvet stretching from horizon to horizon. Being the young boy I was at the time, I suspect that between being dressed up for Christmas services, sitting through those services, and another hour in the car getting there, I hadn’t had any chance to blow off steam in several hours. My mother expressed mild reservations about the welfare of my good clothes particularly my shoes, and then let it pass when she noted I had my boots on, and went about attending what she’d come down to do. So, off I walked into the cold night for a brief respite from being around people all evening. I suppose there was a certain level of boyish excitement over Christmas, and the gifts that would certainly come in the morning. These quickened my steps somewhat as I plodded through the snow. The cold did too. For some reason I always find myself walking just a shade faster when it’s cold outside. Suddenly, I found myself about a half a mile away from the farmhouse. In my speed and being centered on my own thoughts, I’d covered rather more ground than I had intended. I stopped to turn around and look at the farmhouse. I remember the sight of the house lights through the windows, and the porch light over the distance covered. It looked warm and inviting. But something wanted me to stay for a moment. I remember that it was a moonlit night that night, and that the farmhouse, which was painted white, gave off a rather surreal blue-tinted glow as it reflected the moonlight. It was at that point that I noticed that the snow that had fallen for the last few days, which was fairly well unspoiled this far away from the city, also had the same glow. The entire valley, in fact, was bathed in moonlight and shadows. I don’t believe I’ve ever seen the place look so beautiful before, or, for that matter, since. I had always thought of farm fields in winter as being bereft of life, and for that matter, of joy. Not so, tonight. Instead, I found to my surprise that there was a beauty here. Beauty, despite the isolation, or was it because of it? And I paused. It was hard not to. Have you ever sat back or stood alone and simply listened to the quiet? Particularly, at night. Your senses, used to being flooded with sounds and sights, become starved for input; you start paying closer attention to what little sound and sight there is… you become more attuned, more aware. And somehow, more alive. I listened to the little bit of wind that was coming down the valley, and chilling the tips of my ears, and of my fingers. I often did that, here… simply focused on available noise…. But not often, in winter and seldom at night. Normally, during the day in the summer months in this valley you can hear all sorts of animals and insects and birds. All that being what my grandmother to found attractive in the first place. Usually, you can also hear jet planes going overhead, back in that day, turboprops. This was, after all, the mid- sixties. Not tonight for that, but there was a train, I recall. The Erie Railroad put up a mainline in 1852, through here and still owned it at the time a little over 100 years later…. perhaps six miles to the north of the house. It belongs to Norfolk Southern these days. On most summer nights if the crickets were quiet enough you could hear the horn. Often, you could hear the diesel engines. Tonight, it was so quiet, you could hear every wheel on that train. You could count every axle as it bounced over the switch just to the west of the little town. You could hear every knuckle’s squeak it strained against the others going over uneven spaces of track. I stood frozen still in the cold, breath rising in steam about my head, listening; amazed I could hear so much detail from such great distance, even being carried on the cold north wind that night. Once the train passed, and faded out of hearing, I could hear voices. Now, understand… The nearest house, other than the farmhouse, was three miles or so away, and in the middle of that deep valley, the echoes were rather pronounced and confusing. I had no idea where they were coming from, or what they were saying, even, but it didn’t really matter, in truth. I could hear, though, they certainly sounded happy. And yes, you could hear, just by listening, the happiness…. no…. the JOY...in their voices. It was that quiet. Remarkable! I don’t fully understand why I found this experience such a moving one. Maybe it was the combination of the cold and the blackness of the night sky (aside from the moon and stars of course) that made me feel particularly lonely. Well, maybe lonely isn’t exactly the right word. Because I swear to you I almost felt that I could hear the voice of God himself speaking to me, in that place. Just as I started entertaining that odd thought, midnight came, and with it, the sound of bells. To the south, a single joyous chime over and over and over again. To the north and a bit to the east, a Clarion that previously I didn’t even know existed, started to play “Hark, the Herald Angels Sing”. And I sang along, softly. Reverently. The situation seemed to call for some degree of reverence. There was a kind of awe in all of this, the degree of which I’ve never felt in any church I’ve ever been in, and I’ve been in many, in the years since that night. After a time, the cold started to seep in, and so, I turned around and started back to the house. I observed my shadow in the snow as I walked along, placed there by the moonlight behind me, and the sound of the snow as it cracked and crunched beneath my feet. It was easy enough to imagine that if it turned around, a host of angels would be there, ready to burst into song. The moon was certainly bright enough that night, and the small miracles that I had been exposed to on a simple Christmas Eve walk, had prepared me for no less. I didn’t dare turn around, for fear of breaking the spell, somehow. About this time I heard my mother’s voice sweeping up the valley on the wind, calling my name. My parents were ready to leave. I shook my head, smiling. My timing, apparently, was perfect. We got back in the 66 Chevy BelAir that Dad drove at the time, and drove the 60 miles to our home. I remember that I was rather subdued on the trip home. If either of my parents noticed the change, they didn’t say anything. Perhaps they thought, it being a long day that I was tired. That wasn’t it at all, however. Truth is, I was still reveling in the experience. I felt I’d been given a special gift, that night. That regardless of whatever gifts may have been waiting for me under the tree at home, I’d always have this one. That very special and irreplaceable gift is refreshed and renewed every time I hear a Christmas Clarion. 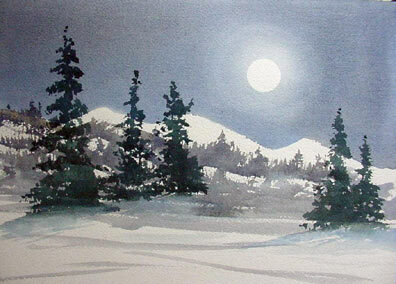 Loud or soft, near or far, I’m always straining to hear it come down the valley on the clear midnight wind, with the cold nipping my ears… and the moon… or is that a band of angels… over my shoulder. Author’s Note: I want to take a moment to gratefully acknowledge the proofreading and editing efforts of Lorie Byrd .